Bath tub refinishing is an excellent alternative to total tub replacement if you're considering a bathroom remodel. Even if your current tub is discolored, chipped, rusted or worn out, refinishing can still be far less expensive than a replacement. The National Kitchen and Bath Association's estimates the total cost of a tub replacement and removal at $3,000 or more. Instead of spending thousands, a quick visit from Miracle Method can save you up to 75% off the cost of a full replacement. Don't replace your tub - Refinish it! The Miracle Method process of bath tub refinishing consists of several steps. First the tub will be given an intensive and thorough cleaning. Using a special two step cleaning process, years of oil, soap scum, and mineral deposits will be removed. Cleaning the surface properly ensures there's no interference when it comes time to bond the new finish too the tub. 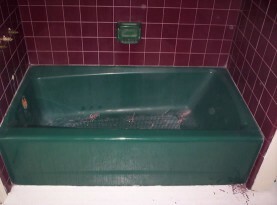 After the cleaning, any cosmetic damage the tub has sustained over the years will be fixed. Chips, cracks and pitting can all be smoothed over and made to disappear with a special repair process. Next, a proprietary Miracle Method bonding agent known as MM-4 is applied to the surface of the tub. This ensures a complete and lasting bond is made between the base surface of the tub and the newly applied finish. Without a proven bonding method, the new finish can separate or delaminiate. Miracle Method's MM-4 bonding agent is proven and has been used for over 38 years across the country. The final step is the application of your new durable tub finish. Tubs are traditionally finished in shades of white or almond, but the Miracle Method bath tub refinishing process offers you a wide range of color options. 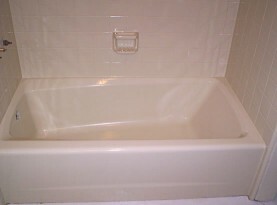 Your tub can be finished to match in home color schemes or be made to stand out sharply. For a truly unique look Miracle Method offers the revolutionary Natural Accents line of finishes. These finishes with the appearance of stone in natural earth tones can add a new level of elegance to a bathroom. Not only can the Miracle Method bath tub refinishing process save you thousands, but it can extend the life of your tub by over a decade. On average a tub that's been refinished Miracle Method enjoys an extra ten to fifteen years of life. If you're considering replacing or refinishing your bathtub, contact Miracle Method today by calling 1-888-271-7690 to Find a Location nearest you.